Happy (slightly belated) Passover and (slightly early) Easter! 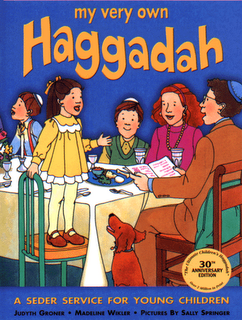 Passover began Monday night at sundown, so we'd like to wish those of you who celebrate it a happy holiday! For those of you who are Easter-inclined, happy Easter ahead of time. Whether you need something to keep kiddos busy at the Seder (when they're not asking the Four Questions or hunting for matzoh), or you're looking for goodies to tuck into Easter baskets, we have a huge holiday display where you can find everything from chirping chicks to wind-up walking matzoh balls. 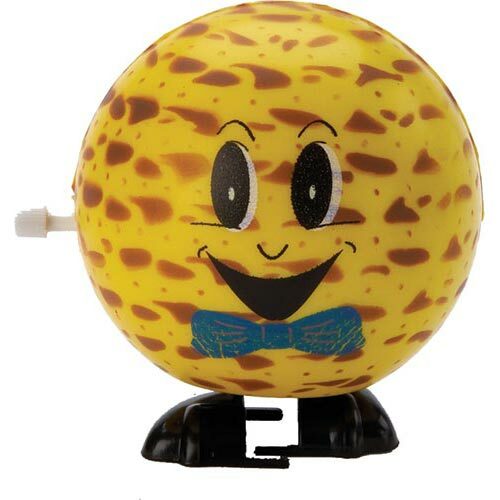 As I mentioned, one of our most exciting Passover items this year is the wind-up walking matzoh ball by RiteLite. With his friendly face and blue bowtie, he'll make a fun addition to the kitchen during the process of making matzoh ball soup. 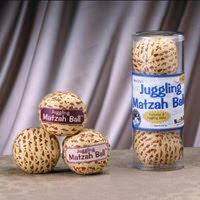 Fun trivia about matzoh balls, by the way: according to Wikipedia, "Joey Chestnut holds the world record for eating matzoh balls; he ate 78 matzoh balls in 8 minutes. The largest matzoh ball prepared weighed 267 pounds and was 29.2 inches long. Setting the Guinness record, the ball was made from '1,000 eggs, 80 pounds of margarine, 200 pounds of matzoh meal, and 20 pounds of chicken base.'" While we're on the subject of matzoh balls, juggling matzoh balls (also by RiteLite) will be a crowd-pleaser while your guests wait for the meal to be ready. These soft bean bags are printed all over with a matzoh pattern and come in a set of three for any juggling trick. Acclaimed Jewish author Elie Wiesel has translated and annotated a Passover Haggadah for the whole family, with a gorgeous text and illustrations. 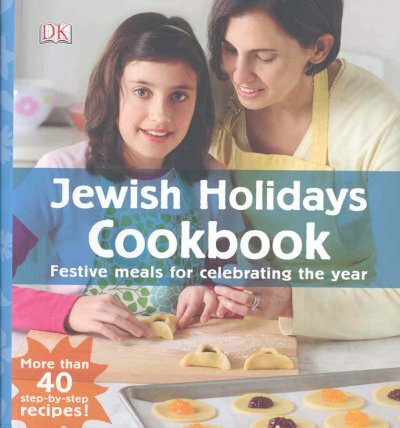 No holiday celebration is complete without traditional foods, so pick up DK's Jewish Holidays Cookbook: Festive Meals for Celebrating the Year by Jill Colella Bloomfield. The clear, step-by-step instructions and photographs allow young chefs to help in the meal preparation without frustration or mishaps. Pesach-specific recipes include haroset, citrus salmon, matzoh brei, and meringue cookies. Each section also offers history of the holiday and traditions for celebration. 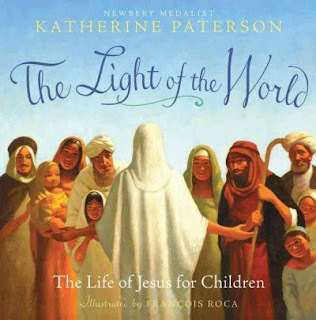 Newly-appointed children's literature ambassador Katherine Paterson has written a lovely picture book biography of Jesus entitled The Light of the World: The Life of Jesus for Children for ages 4 to 8. The gentle text is accompanied by Francois Roca's luminous illustrations in a blue-and-gold palette. The Light of the World introduces gospel stories to young children in an accessible, age-appropriate format. Begin a new Easter morning tradition: a read-aloud of this beautiful book! 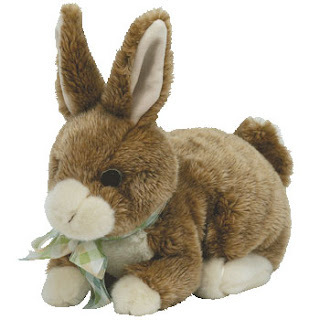 On a (har har) fluffier note, Easter and springy plush abound around the Hut and in the stuffed animal sections. You'll find bunnies, chicks, and lambs of all sizes, shapes, and colors. Some chicks chirp and some bunnies hop! Here's my favorite little guy, "Fielding" by Ty. There's also a plethora of springtime windups that waddle, jump, and swim. Easter just wouldn't be Easter without bunnies! In addition to the tons of bunny stuffies we carry, there's also a huge selection of bunny-themed books. One of my all-time favorite rabbit stories is Little Bunny Follows His Nose by Katherine Howard, with illustrations by J.P. Miller. 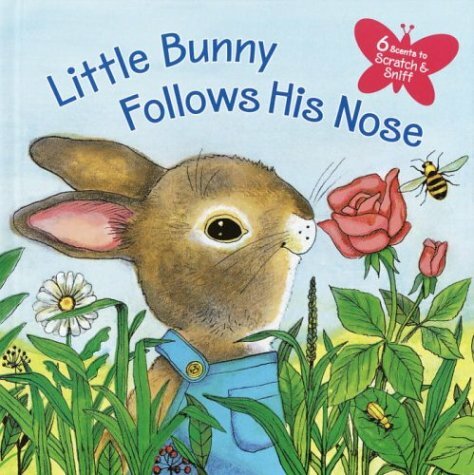 As Little Bunny goes about his day, he stops to smell the roses and plenty of other tantalizing scents. With six scratch-and-sniff spots throughout the book, so can you! 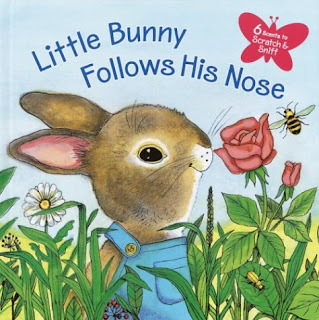 Little Bunny is a particularly fond memory of my childhood reading (as is The Sweet Smells of Christmas by Patricia Scarry, also illustrated by Miller), so I can highly recommend it. Olivier Dunrea's hugely popular Gossie and Gertie series celebrates Easter too! In Ollie's Easter Eggs, Gossie, Gertie, BooBoo, and Peedie dye their Easter eggs, but tell Ollie he's too young to dye his own. 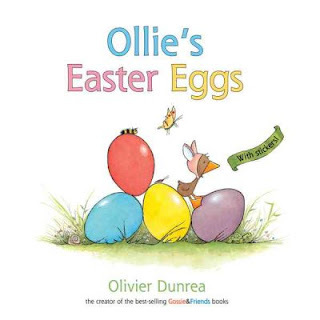 Luckily, Ollie knows a way around that... With bright, happy illustrations and everybody's most anticipated part of Easter -- the egg hunt -- this is a perfect read for toddlers. I love Ollie's Easter bunny ears! Rachel did an incredible Easter/Passover round-up last year which is still applicable, so go take a peep -- er, a peek at he suggestions as well. I've been thinking lately that I might make a thousand origami cranes (or try to, anyway). Japanese folklore says that someone who folds a thousand cranes may be granted a wish -- typically the healing of sickness. I can't tell you my wish, since in American folklore, revealing a wish to others generally means it won't come true! Today the bundles of cranes, called senbazuru, are often made as wedding presents, new baby gifts, good luck charms for a family's home, or get-well wishes for someone suffering from illness or injury. An incredible customer of ours who's undertaken the project herself said the other day that folding the cranes is a "physical prayer or meditation." 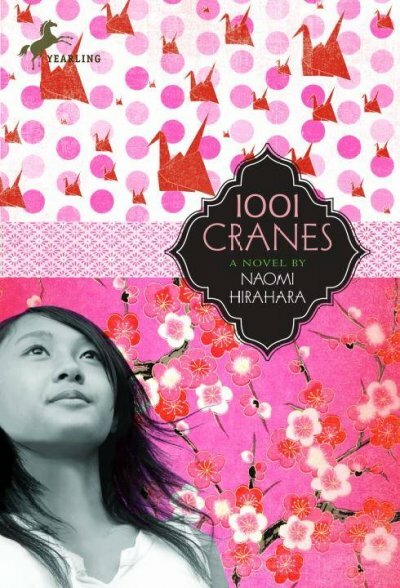 In Naomi Hirahara's 1001 Cranes, Angela is sent to live with her grandparents while her parents begin the process of separation. Angela's grandmother puts her to work folding cranes for wedding gifts in her grandparents' flower shop. 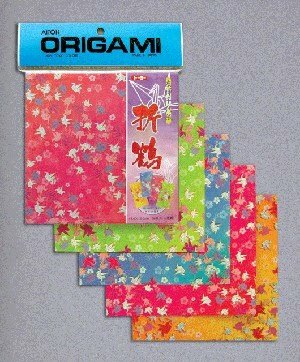 At first, Angela is not only terribly clumsy at the origami but also resentful of her parents' inevitable divorce, her summer away from home, and the expectation that she work in the shop. However, as the summer progresses, she slowly begins to think of the folding as a meditation and an opportunity to deepen relationships with her extended family. I first learned of the legend in elementary school, when I read Sadako and the Thousand Paper Cranes by Elizabeth Coerr. Sadako Sasaki was two years old in 1945 when the United States dropped the atomic bomb on Hiroshima, about a mile from her home. At age twelve, Sadako was hospitalized with leukemia. She and her loved ones began to fold cranes in hopes that her health would improve. 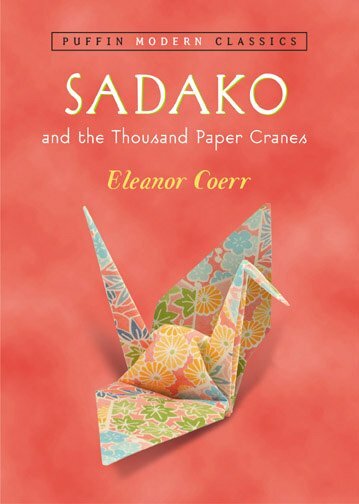 According to some sources, all thousand cranes were finished by Sadako's death in October 1955; Coerr states that Sadako completed only 644, with the rest of the thousand finished after her death by family and friends and buried with her. Either way, after her death, Sadako became an international symbol for the horrors of atomic warfare and the senbazuru inextricably connected to wishes for world peace. Now about 20,000 cranes are sent to Hiroshima each year in remembrance of Sadako and to join the cry for world peace. Aren't they pretty? If I don't make any mistakes with these, I'll only have 932 to go... Wish me luck! 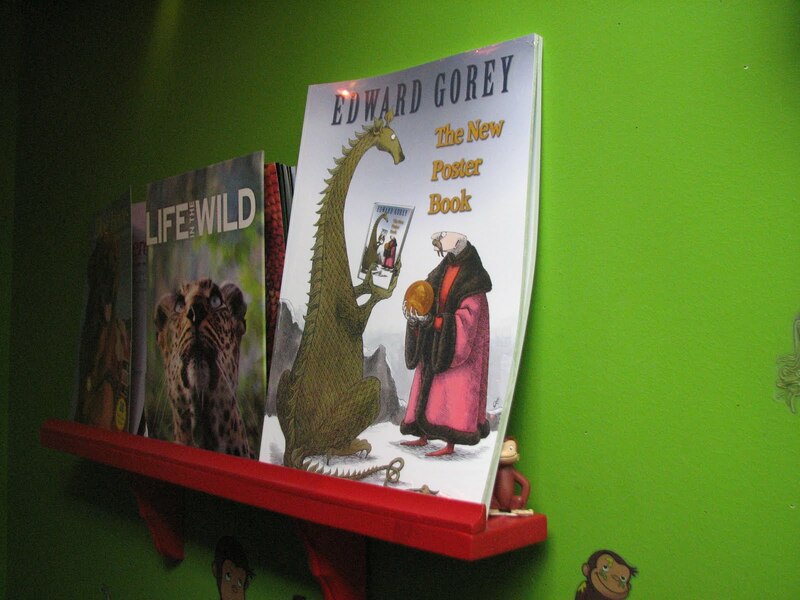 "Curious George Saves the Day"
In the last few days, both the New York Times and NPR have had features about the new Curious George exhibition at NYC's Jewish Museum. Originally from Germany, Margret and H.A. Rey were Jews living in Paris shortly before the Nazi occupation of the city in 1940. Mere days before the Nazis arrived, the couple rode out of Paris on homemade bicycles with their sketches and stories. 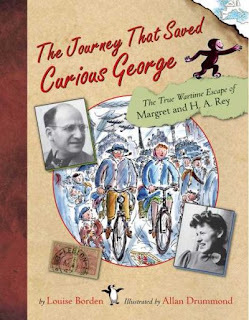 The journey by bike, train, and boat eventually brought them to New York, where they were able to publish their picture books about George and his friends. Both NPR's "On Point" podcast and Edward Rothstein's article about the exhibition give extensive information about the Reys' lives and work. 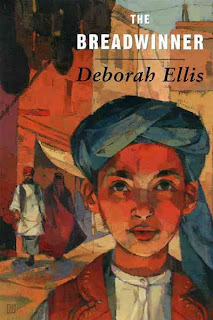 The exhibit includes photographs, personal papers, journals, and -- most exciting -- original sketches and watercolors by H.A. While Curious George may not have, as receiver John joked during the radio show this morning, single-handedly defeated Hitler, Rothstein does praise the subversive nature of such an innocently disobedient character in an era and society where absolute compliance to the Nazi regime was expected. Also check out the NYT's slideshow. 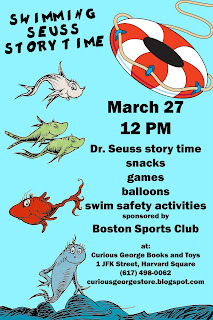 Seuss swim safety event is this Saturday! At the community pool I went to growing up, kids started as "tadpoles" with mommy and me swim classes, then progressed up the food chain (sort of) through minnows, dolphins, and sharks. I never made it that far, but I could use a refresher on how to doggy-paddle without peril. Luckily for me and any lifeguards in my vicinity, our storytime/swim safety demo is this Saturday at noon. Special guests Boston Sports Clubs for Kids will teach us all how to be safe in the water. We'll have games, Seuss read-alouds, fishy-themed snacks, and more for your little swimmers from tadpoles to sharks. Be sure to pick up BSC's swim lesson schedule! This review gets major bananas. 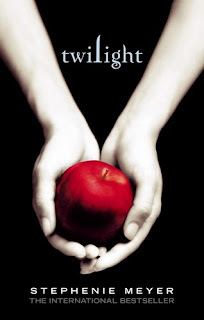 "This was an awful book. Bella has no personality and is constantly pushing away people who actually care about her. Edward is abusive and sparkly. This book gets zero bananas." Thanks to Emily for her well-considered and brave review. 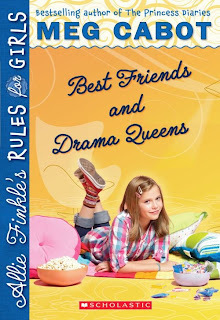 To all our kids reviewers: it's totally okay to post reviews of books you didn't like, too! That way kids with taste like yours know what to avoid, in addition to getting ideas for new books to try from enthusiastic reviews. Please do feel free to talk to a bookseller about what you like (and hate), and what you're interested in reading next. All of us here loooooove to read and to chat about books with other readers! Our book buyer, Donna, likes to hide a George figurine around the store...and we would hide it in her office after she'd left for the day, until she decided to glue it in place! 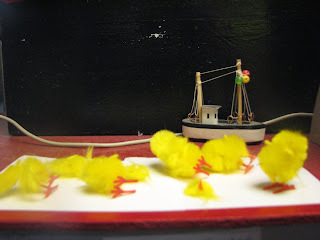 Spring is here, and that means, so are tiny chenille chicks! Unfortunately, some of them get a bit manhandled (chicken-handled?) and they go to this Elysian Field behind the counter. 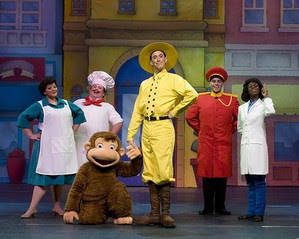 See the Curious George musical on us! The first two people to come into Curious George and tell us they read our blog or Twitter will win FOUR ticket vouchers for Curious George Live!, playing at the Tsongas Arena from April 23-25. Don't fret if you miss the window of opportunity; we'll be doing this each week until the show (starting on Mondays)! The Curious George Live! folks also gave us coupons for $3 off tickets, so even if you miss out on freebie tickets, you can still get discounted ones! I have so much exciting stuff to share with you that you'll want to hold on to your yellow hat. -- Voting for the Children's Choice Book Awards is in full swing to prepare for 2010 Children's Book Week, coming up in May. 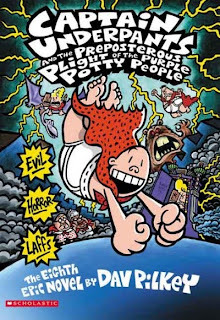 Heavyweight contenders include Suzanne Collins, Jeff Kinney, and Rick Riordan. Make sure to have your say at the voting page! 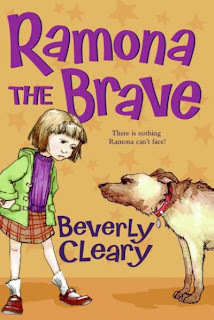 -- Speaking of voting, School Library Journal's Battle of the Books has also started (we're actually into week 2 already). Watch great novels and nonfiction duke it out for the admiration of your favorite authors. -- I blogged yesterday that we're giving away pairs of tickets to Curious George Live! but then we realized that getting four tickets would be twice as fun. The first two people each week before the shows (weekend of April 23-25) who come to the Hut and mention they read the blog will get FOUR vouchers redeemable for Curious George Live! tickets. -- In addition to more (!!!) fairy godperson gifts of books showing up for me, yesterday brought an ARC of Linger, the second Wolves of Mercy Falls book by Maggie Stiefvater. Unlike magical, serendipitous Penguin packages, this was one I had been expecting (thanks Nikki at Scholastic!). Super-receiver John is probably relieved that my almost-daily ants-in-the-pants ritual of "Is it here yet?....How 'bout now?" is, at least for the moment, over. And there was much rejoicing in the Hut. 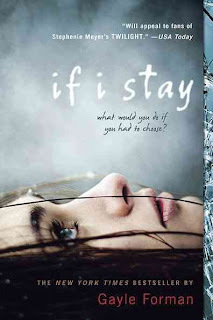 The new Penguin books are Laurie Halse Andersen's Wintergirls and Gayle Forman's If I Stay. I read Wintergirls when it first pubbed in hardcover and loved it, so Natasha snatched it up. I'm looking forward to If I Stay, which I've heard nothing but good things about. Thank you Penguin! A little bird (OK, my roommate who heard from a co-worker who heard from some other source) that Martin Scorcese, fresh off Shutter Island success, is adapting Brian Selznick's 2008 Caldecott winner The Invention of Hugo Cabret into a film. I did some internet research and found factual evidence on Reel Loop, via IMDB. Let's clarify... this will be a cinematic, graphic novel about film to be made into a film? I wish you the best of luck, Scorcese. Here's hoping it's another Fantastic Mr. Fox style success. We love to see what you think about what you've been reading, so keep up the great work! ...well, not exactly, but merchandise buyer Ellen has made some awesome new finds lately that span the globe! We've been expanding our foreign language section to include even more fun multilingual resources. Little Pim offers a great new line of foreign language learning tools for babies on up. 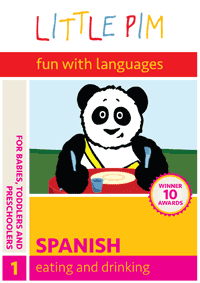 Kids speaking their first language with adorable panda Little Pim himself share everyday vocabulary and phrases. 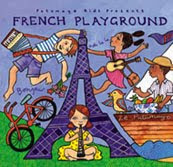 We have several levels of Spanish, French, and Chinese DVDs, flash cards, and even catchy pop music! 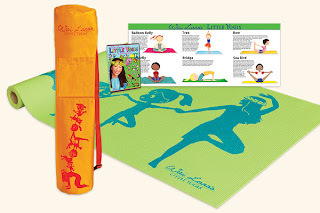 I'm most excited about our new WaiLana Little Yogis items: kid-sized, eco-friendly yoga mats, inflatable yoga balls, and even a full yoga kit with mat, carrying bag, instructional DVD, and pose poster. Best of all, these are perfect activities for rainy days indoors when your little ones (and yourself) are bouncing off the walls! We have not one, but three new books illustrated by our oh-so-talented and all-around-lovely alumna Julia Denos! Julia's previous work includes the early reader biography Sojourner Truth: Path to Glory by Peter Merchant, the early chapter book series Sleepover Squad by PJ Denton, and the picture book My Little Girl by country singer Tim McGraw. 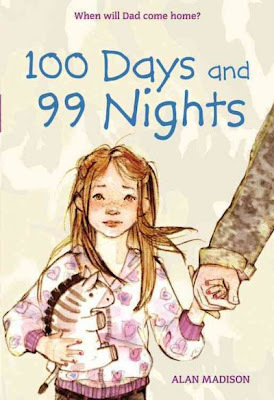 - 100 Days and 99 Nights by Alan Madison, an early chapter book about Esme's long wait for her father to return from his tour of duty. - Cornelia and the Great Snake Escape by Pam Munoz Ryan, an early reader in which Cornelia tries to convince her mother that her new snake Corny is a great pet -- not an easy task when he escapes from his cage! - Cornelia and the Show-and-Tell Showdown, the second Cornelia book, in which taking Corny to school for show and tell is a more daunting adventure than Cornelia expected, especially with bully Jason pestering her pet. Now accepting entries for the annual Art and Writing Contest! Our annual Just for Kids Art and Writing Contest is here, so break out your pens, pencils, markers, paints, typewriters, or word processors and start working on your masterpieces! You may enter one or both contests in your age group. Illustrate a scene from your favorite poem, short story, fairy tale, or book. Please be sure to label your artwork with the title and author of the work you've chosen to illustrate. Write an original short story, poem, or essay (three pages maximum). Pick up an entry form at the register, or print one from the blog. All entries must be postmarked or turned in to the store by May 14. 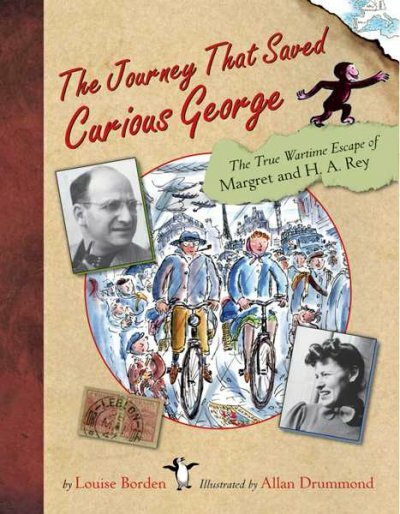 Results will be announced on our blogs (Notes from the Hut and Curious George's Art and Writing Contests) on May 15. Winners will be notified by mail. Prize-winning work (1st, 2nd, and 3rd places, plus honorable mentions) will be posted online, and winning art will be displayed in the store's Yellow Hat Gallery through the summer. 1st place through 3rd winners will receive store gift certificates! No purchase is necessary. All kids ages 5-13 are eligible, except relatives of Curious George employees. Please enter each contest only once; children submitting multiple entries in either contest will be disqualified. Children should enter only their own work. To print, right click and select "open link in new window." When the new window opens, select "print" under your browser's file menu. Now that you know all the rules, put on your thinking cap and get started! Good luck to all our entrants! The guest blog series strikes back! 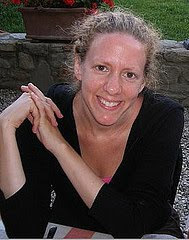 We're thrilled to have YA author Robin Wasserman as a guest blogger! I can't possibly improve upon the bio on Robin's website -- "writer, chocoholic, certified procrastinator, TV addict, sometime cupcake baker, and all-time world champion klutz" -- except maybe by pointing out that Robin has written Hacking Harvard, Chasing Yesterday, and the Seven Deadly Sins series. The second book in her Skinned trilogy, Crashed, pubbed in September. Whether your taste runs toward snarky high school drama or dystopian sci-fi, Robin has a great book for you! First of all, thanks for having me on your site; I’m so excited to be here! 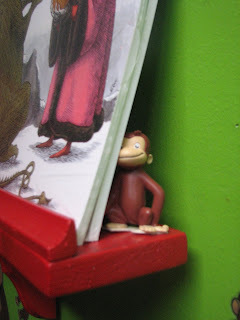 I lived in Cambridge when I was in college and used to stop by the Curious George Bookstore whenever I needed a pick-me-up. I would stare at the “W” section on the shelf and dream of seeing my own name there someday. So it’s a little surreal that it’s actually happened. Clearly Curious George is some serious good luck. How soon can we get our hands on the third Skinned book, Wired?! Well, as of this week, the manuscript is officially finished, so you’re definitely one step closer. 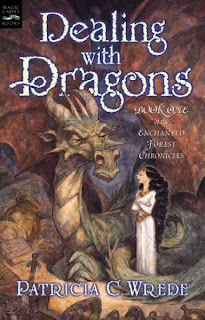 But the book won’t be in stores until September 2010 (plenty of time to go out and read the first two in the trilogy…). I was a huge sci-fi fan when I was a kid, so I definitely have no issues with the term. I always figured I’d grow up to write books about spaceships and aliens and time travel, but I guess for the moment, angsty mechanical teenagers will have to do! That said, I don’t approach these books any differently than the realistic fiction I’ve done (except for the fact that I do a bit less on-the-spot research, since it’s hard to go visit the future). I think when you’re writing about a world that doesn’t exist, it’s incredibly important to make sure that the characters and their relationships feel grounded in reality—that their experiences and emotional reactions are just as believable and identifiable as they would be in any conventionally “realistic” novel. Lia, the main character in Skinned, may be living in a dreary dystopia, trapped in a mechanical body, but that’s reality for her. She doesn’t know that she’s in a science fiction story, so as I write, I try to pretend she isn’t. Although I do enjoy the occasional robot song. This one is not to be missed. What was the inspiration for the Seven Deadly Sins series? Was it ever tempting to stop at, say, the third or fourth deadly sin? In 2003, I moved from New York to LA, and spent a couple weeks driving all my stuff cross country. It was the first time I’d ever seen the desert, and I was blown away. There was something about the broad expanses of arid land dotted by cacti, deserted highways, and the occasional dusty, small town that grabbed hold of my imagination and wouldn’t let go. I couldn’t stop wondering what it would have been like to grow up in a place like that. You’ve blogged about the idea that some books are “bad influences.” Has there been any controversy about your books, i.e., accusations that they “make teens do things”? When the Seven Deadly Sins came out, I worried that there would be some uproar, especially since the title seemed to invite it, but I’ve been fortunate in having very few challenges issued to my books. However, I’ve watched several of my friends deal with their books being challenged in schools and libraries all over the country, and it never fails to alarm me to see words and ideas labeled as dangerous. How did you and Scott Westerfeld become “partners in crime”? I still remember sitting in airport several years ago, shortly after I’d sold the Seven Deadly Sins, reading an advance copy of Uglies. I loved it. And I couldn’t believe I was going to share a publishing imprint with the author. Over the next couple years, I read and loved Scott’s other books (including the final book in the Midnighters trilogy, my current favorite), and eventually I got to meet Scott himself. I was incredibly intimidated and, I’m sure, made a complete fool out of myself as I babbled about what a fan I was of his work. Miraculously, I managed not to scare him away, which turned out to be a lucky thing for me. Scott is about as generous as he is brilliant, which means I’ve gotten a lot of advice from him in the last couple years. (And he’s as brilliant at the advice-giving as he is at the writing.) This fall our publishing company sent us on the road together for a week, and the rest was history. (Or at least, it was a fabulous road trip with plenty of very cool Westerfeld fans and some excellent food and drink along the way). Thanks so much to Robin for the post (and bonus Flight of the Conchords video)! Make sure to check out Robin's website, blog, and Twitter, all of which are thoughtful and hilarious. I totally want to invite Robin over to bake cupcakes (with chocolate, of course -- and I hope she doesn't mind vegan) and talk YA. An update on the books from my fairy godperson at Penguin! I'm in the middle of Jandy Nelson's brand-new YA novel The Sky is Everywhere. After her exuberant older sister Bailey dies suddenly, shy Lennie can only seem to feel two things: "crazy sad" and boy-crazy. Gram, Uncle Big, and Bailey's boyfriend Toby are devastated as well, and the four of them drift through their small town seeing nothing but Bailey's absence. Lennie's new classmate Joe is an unexpected source of comfort, but Lennie's torn between him and the off-limits Toby. With its just-slightly-larger-than-life hilarious characters, wrenching plot, and exquisite writing (both prose and poetry), I can only manage a few pages at a time before my heart hurts and I have to put it down.... but this is my next staff pick for sure! And it looks like Incarceron will be a movie! It'll be a while, but between The Lightning Thief and Alice in Wonderland out now, the upcoming Legends of the Guardians [of Ga'hoole] adaptation, and the long-awaited Harry Potter and the Deathly Hallows, our movie adaptation viewing schedule's planned for at least a month or two. :) AND DIARY OF A WIMPY KID, oh my gosh. I can't believe I forgot with our life-sized Wimpy Kid in his director's chair right in front of me. Staff fave (and Cambridge-based) publisher Candlewick Press just launched a program to show their appreciation for indie booksellers! Candlewick's Handselling Indie Recognition Program, or CHIRP for short, rewards indies with sneak peak books they're especially proud of in the upcoming season. They also encourage booksellers with tips for stronger handselling and cute CHIRP-printed shelftalkers for staff picks. We're frequently complimented by customers on the thoughtfulness and knowledge of our staff members when recommending books. We're so happy to hear that Candlewick -- whom we love -- thinks these are valuable traits as well! Happy birthday to you (and Thing One and Thing Two)! 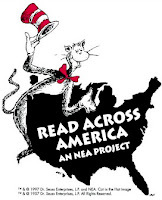 In honor of Dr. Seuss, today is also annual Read Across America day. Schools, libraries, government programs, and even the First Family are celebrating Dr. Seuss's birthday by renewing their dedication to literacy. Meanwhile, the "Cat-a-Van" wends its way through the states, treating students to read-alouds and donating funding and books to needy schools and their libraries. Check out the Library of Congress's Read.gov for more information on national literacy programs. We'll be celebrating too with an upcoming event! 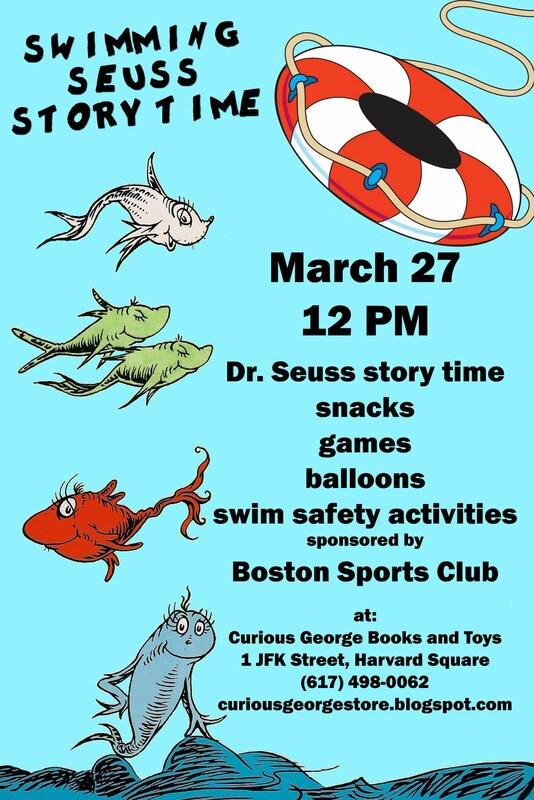 Boston Sports Club for Kids will be joining us for story time on March 27th. They'll do a swim safety demonstration and fun activities to follow the reading of One Fish, Two Fish, Red Fish, Blue Fish. Come on in at noon as usual.